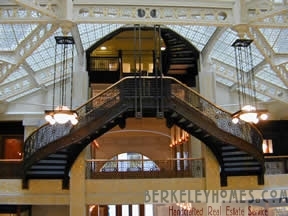 You'll find a wealth of wonderful architecture in Berkeley, the East Bay, and the San Francisco Bay Area. We're blessed with some of the most remarkable structures in the world. Oakland's Paramount Theater, Berkeley's Temple of The Wings and Unitarian Church, and the Golden Gate Bridge are some of my favorites. Break out your maps and camera... and enjoy! Art Deco has always had tremendous appeal to me - perhaps it started the first time I saw the Empire State Building or Chrysler Building when growing up in New York City. I loved the clean lines and modern contemporary design. 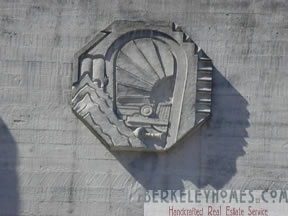 There are some wonderful examples of Art Deco in the Bay Area - most of which are in Oakland and San Francisco. Heres are some places you don't want to miss on your tour. The Art Deco Society has an annual meeting and tours (we took one of Pacific Heights the day before I wrote this!) I particularly enjoyed the night time "neon sign" tour, as well as their tours of downtown Oakland and San Francisco, and the Marina District in San Francisco. The tour to the Gladding Mc Bean Terra Cotta Company in Lincoln, California was a special treat. Michael Crowe has written an excellent book "Deco By The Bay: Art Deco Architecture In The San Francisco Bay Area"
San Francisco has delightful Art Deco buildings, particularly at 1360 Montgomery, Coit Tower, and the Marina. Travelling to New York City or Chicago? I was born in Manhattan and grew up in The Bronx... so I'm in love with the Big Apple. If I weren't such a New Yorker, then Chicago would have been my favorite U.S. City. Here are pages with links to my favorite architectural sites.. and maps in New York & Chicago. The little bears around fountain get decked out in decorative wreaths during the holidays. They have charming little bellies. We call them buddah bears. For decades this was just a grassy circle, and it’s wonderful that the fountain was recreated. I believe that Lawson was a geologist or structural expert, so Bernard Maybeck designed this Pompeiian villa to withstand earthquakes. It’s still there, so I guess his design worked. Experimental Architecture - I recall that Maybeck dipped burlap sacks in concrete or stucco... then used them as architectural elements. Maybeck built this for his son and daughter in law, Jacomena. I met Jacomena when I lived on Buena Vista Way. I think they originally lived in the wonderful home on Purdue in Kensington. 720.97946 N813 BAHA - Berkeley Architectural Heritage Association has an excellent series of tours and books on Berkeley's extraordinary architecture. 510-845-8542 Once St. John’s Church, now a lovely performance space. The first time we sponsored Sedge Thomson’s “West Coast Live” (91.7 FM Saturday 10 AM-Noon), the show was at the Julia Morgan. Check out the building during a performance - it's a treat. Bernard Maybeck designed this church. Visit inside - it’s a treat! 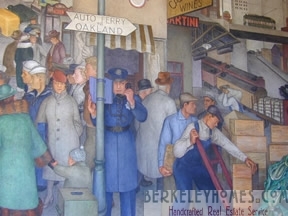 510-644-6121 Berkeley High School has a set of Art Deco murals on Martin Luther King... I only wish they did a two tone or three tone paint job on it! 510-848-0181 Small Berkeley History Museum definitely worth a visit when you’re in the area. Limited hours - check the web site to make sure they’ll be open when you visit. 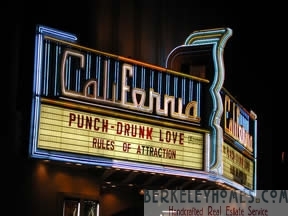 510-841-2242 Interested in Berkeley Architecture? Join! 800-275-8777 This is one of the most handsome buildings in Berkeley, and I have the pleasure of seeing it several days a week when I work out at the Berkeley YMCA. It’s worth a visit. Murals inside. Berkeley’s Santa Fe Railroad Station once was the Santa Fe Bar & Grill. The restaurant's now closed, and I believe the building will be "repurposed" (what an awful word) to a school. 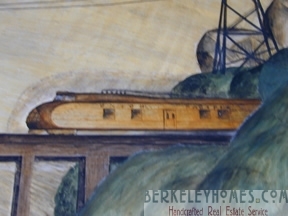 When I first moved to Berkeley in 1974, the Santa Fe trains still ran across University Avenue. I miss those days. There no longer was passenger trains, but it was kind of nice (except when I was in a hurry) to see railroad cars in Berkeley. 510-524-5500 A wonderful place to browse for salvage items. Carol and I saw this home during an architectural tour... and I spent the next 5 years trying to find it again. One day I was driving north on Purdue Avenue, and realized I’d rediscovered it. The home is almost monastic in its simplicity - lovely living room, small bedrooms along a walkway, and is sited at the crest of the hill... with lovely natural vegation all around. 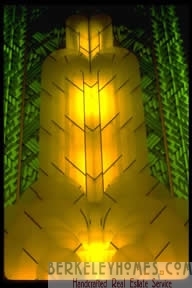 Art Deco structure next to Lake Merritt. The tile murals inside the south entrance of the building are delightful! 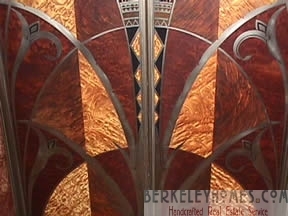 Be sure to look at the terra cotta mural above the front door. Breuner’s was a long time furniture store, and I’m delighted they created this Art Deco building. 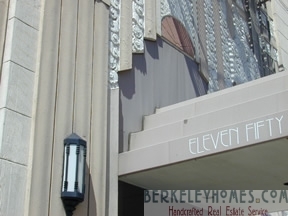 Another of downtown Oakland’s Art Deco jewels. The green terra cotta is similar to the Bruener’s building . The URL above refers you to the Friends of Terra Cotta database, which includes the exterior of Oakland's I. Magnin building. 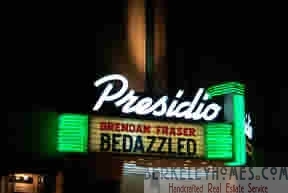 510-869-3519 An architectural jewel of the East Bay. I've never been inside it, and look forward to the day when it's restored as beautifully as the nearby Paramount Theater. 510-874-7580 Oakland moved some wonderful victorian homes to a "Preservation Park"... with a pretty fountain. Just a few steps from Downtown Oakland. Ford built this large assembly plant along the waterfront... and ships brought in supplies and took away automobiles. Ford Model A #1 is in the Richmond History Museum. Ford didn't have room to expand, and eventually moved the plant to Fremont (which is now the Great Mall of The Bay Area. Appropriately, the plant was used as a site in the movie "Tucker"
This handsome building was designed by Albert Kahn, and hopefully will be converted to live/work studios and ferry terminal/business facilities in the future. Art Deco has always had tremendous appeal to me - perhaps it started the first time I saw the Empire State Building or Chrysler Building when growing up in New York City. I loved the clean lines and modern contemporary design. 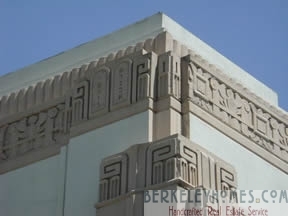 There are some wonderful examples of Art Deco in the Bay Area - most of which are in Oakland and San Francisco. Heres are some places you don't want to miss on your tour. The Art Deco Society has an annual meeting and tours. I particularly enjoyed the night time "neon sign" tour, as well as their tours of downtown Oakland and San Francisco, and the Marina District in San Francisco. The tour to the Gladding Mc Bean Terra Cotta Company in Lincoln, California was a special treat. Michael Crowe has written an excellent book "Deco By The Bay: Art Deco Architecture In The San Francisco Bay Area" San Francisco has delightful Art Deco buildings, particularly at 1360 Montgomery. 510-526-1935 Dan Smith was our architect when we remodelled our home... and he did a wonderful job. That was 20 years ago, and I can only imagine what wonderful designs he's come up with since then. 415-395-5067 Another Art Deco Treasure, one of the few buildings left from the 1939 Worlds Fair. It’s an interesting museum, with a spectactular view of San Francisco. 510-254-9060 Extraordinary and unusual marquee visible from I-24, and interesting murals inside! We always enjoy going to movies here. 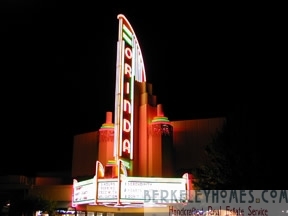 The Orinda Theater expanded into the bank building to the south, and kept the Art Deco feel of the building. It's just short distance from Berkeley, and worth the trip to see the building. It’s spectacular at night. If you're adventuresome, take Grizzley Peak to Fish Ranch Road. 408-247-2101 Great fun. Sarah Winchester was told that if she moved west and built a house, and kept on building, she would not be plagued by the spirits of the ghosts of people killed by the Winchester Rifle. It’s a remarkable home - beautiful details, staircases that go nowhere, cabinets which are an inch deep, and a maze of rooms and hallways. 310-396-5991 Exhbits from wonderful designers Charles & Ray Eames. We visited their home in Santa Monica.. a delightful "case study" house. 415-982-3326 We've been on some fascinating Art Deco tours with them... they have annual Art Deco Weekends in San Francisco, and links to other Art Deco sites around the world. 626-793-3334 The Gamble House is one of the Greene & Greene masterpieces in Pasadena. Inspired by beautiful Japanese woodwork... it's a joy to behold. One of the most interesting rooms is Mr. Gamble's office.. I can imagine the conversation in that family - you can do whatever you want with the house, but I want MY room to look like a Victorian Parlor. 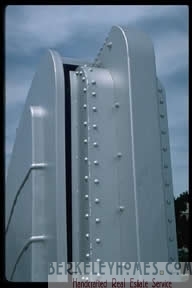 Greene & Greene Makinson, Randell L.
Art Deco Architecture Web site for Art Deco Architecture. Architecture and Design I've been interested in photography, architecture & design for years... and it still is one of my great loves. 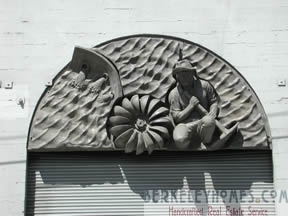 I usually carry my digital camera when I travel around Berkeley... you never know when something will catch my eye. When travelling, I bring along the cameras (Nikon 950 Digital & 6006 Film) and Canon Digital Movie... and shoot away. If you have a digital camera, consider carrying extra flash memory cards, and a PCMCIA adapter so you can transfer your photos to your laptop. 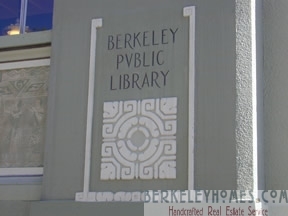 You'll find a wealth of wonderful architecture in Berkeley, the East Bay, and the San Francisco Bay Area. We're blessed with some of the most remarkable structures in the world. Oakland's Paramount Theater, Berkeley's Temple of The Wings and Unitarian Church, and the Golden Gate Bridge are some of my favorites. Art Noveau & Art Deco Art Noveau & Art Deco furniture, art, books, pottery, and more. They have several sales during the year.